In honor of every single, dreaded Monday, the note/photo above just seemed appropriate. 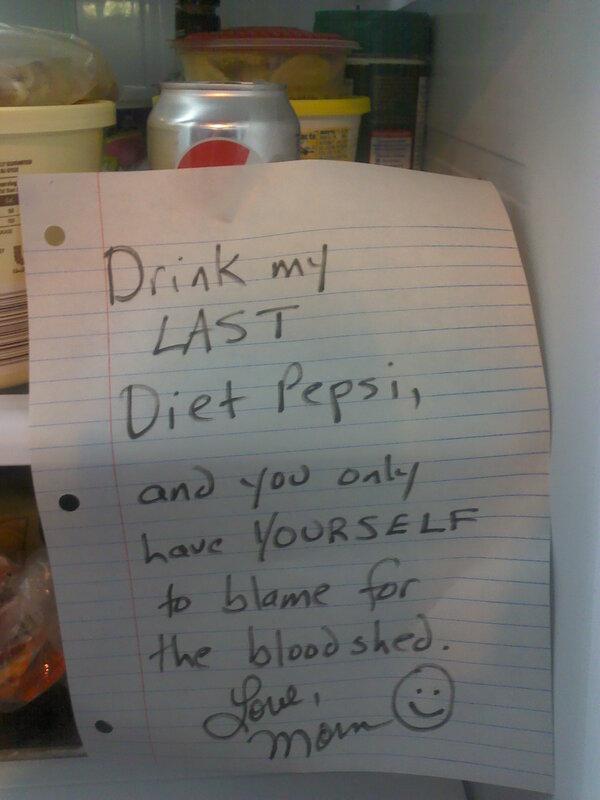 And, yes, I did post this EDICT in my fridge after one very BLEAK Friday when I awoke at 5:30 AM and realized that my life was SANS Diet Pepsi. Since I can’t drink coffee because it makes me nauseous, I did not appreciate having to wait until 7:30 for my morning glory and/or having to stop at a bodega near the college where I was teaching at the time – to obtain the aforementioned life-sustaining elixir. How did this happen, you ask? Well, apparently, one of my son’s friends who was unaware of the death knell accompanying his thievery, did, in fact, slurp down my last beloved can of fizzy deliciousness (a.k.a. Diet Pepsi). And, no, I do not own any samurai swords, brass knuckles, machetes and the like, nor would I use my husband’s Russian rifle. That SAID, here’s to surviving another day in the trenches everyone as I guzzle my last DP of the day with a grateful sigh knowing that there’s another 12-pack in the garage just waiting to be cracked and consumed!